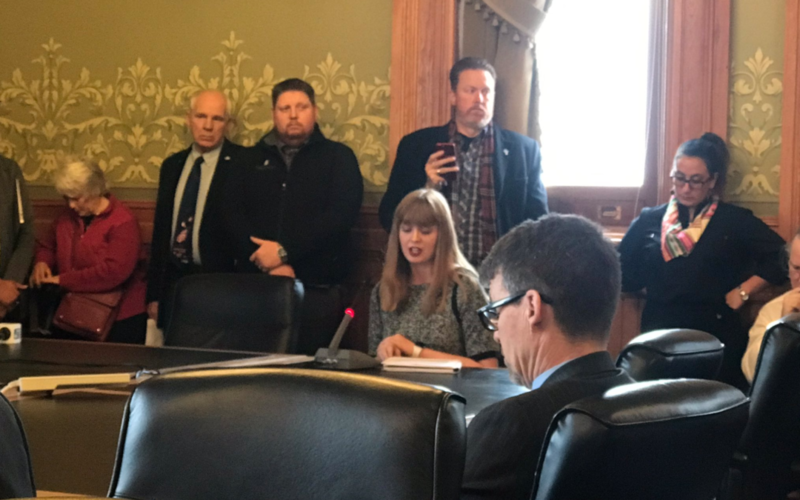 Yesterday at the Iowa Statehouse, SJR 9, was passed out of the Iowa Senate subcommittee 2 – 1 and is now heading to a full committee vote. Among those who spoke, was Caitlyn Dixson, Iowa Right to Life executive director. Her remarks are shared below. My name is Caitlyn Dixson and I am the Executive Director of Iowa Right to Life. I’m here today to voice our support of Senate Joint Resolution 9. “All men are, by nature, free and equal, and have certain inalienable rights — among which are those of enjoying and defending life…” which is directly from Article I, Section I of the Iowa Constitution. It’s interesting to me that a document which starts by speaking about a person’s inalienable right to life also includes an unwritten ‘fundamental right to abortion’. SJR 9 is a piece of legislation we shouldn’t need but do. It is a bill that gives the power of lawmaking back to the people of Iowa through their elected representatives in the legislature, instead of in the hands of unelected, activist judges. It reinforces the system of checks and balances between the three branches, the entire foundation on which the United States government was built. Iowa deserves to have laws that are able to change and evolve over time to reflect the thoughts of Iowans. The climate in Iowa today is pro-life. You can see that in the adoption of the Heartbeat Bill last year, eventually making its way to the Governor’s desk where it was signed into law. It took an act of blatant judicial overreach to overturn the law, going directly against what Iowans want. Not supporting SJR 9 would be telling people like me, that our views don’t matter. As a mother, I hold close the call in our Constitution, the call to defend life. At sixteen years old, I was on the table at an abortion clinic where I was shown an ultrasound image of my son’s head. I have been questioned why I did not choose to have an abortion, and I have stood by my decision every single day. I have heard the talking points that women should not be held down by pregnancy, but I stand here and know that this is scare tactic employed. It couldn’t be farther from the truth. We should not scare women into choosing life, and we must not allow them to be scared into abortion because we say that children will never empower you, but it did for me. I chose life then, I choose life now, I will continue choosing life, and I ask that you do the same. Thank you.